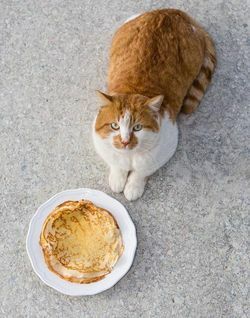 Moscow, February 20, Interfax - Main symbol of the Kerch bridge construction site - cat Mostik (the Russian for bridge), on whose behalf joking posts are written in social nets, grew fat during the Pancake week and needs a diet. "Maslenitsa is over. It is a nice holiday, but I’ve grown fat. One more pancake and I return to my favorite shrimp diet," reads an inscription under the cat’s photo in a social net. Mostik’s subscribers do not support his wish to lose weight and promise to convey him tasty souvenirs, when they will go to Crimea for holidays. The cat joined the building team in 2015. According to the recent information, he lives at the checkpoint. The pet’s official name is Most the Cat, in one of the social nets he has over 20,000 subscribers, he promised them to make the first selfie on the bridge when the construction works would be over.